US Airways CEO Doug Parker was in Philadelphia on Tuesday, touting the benefits of a merger with American Airlines and reaffirming that Philadelphia would be key to the combined airline. 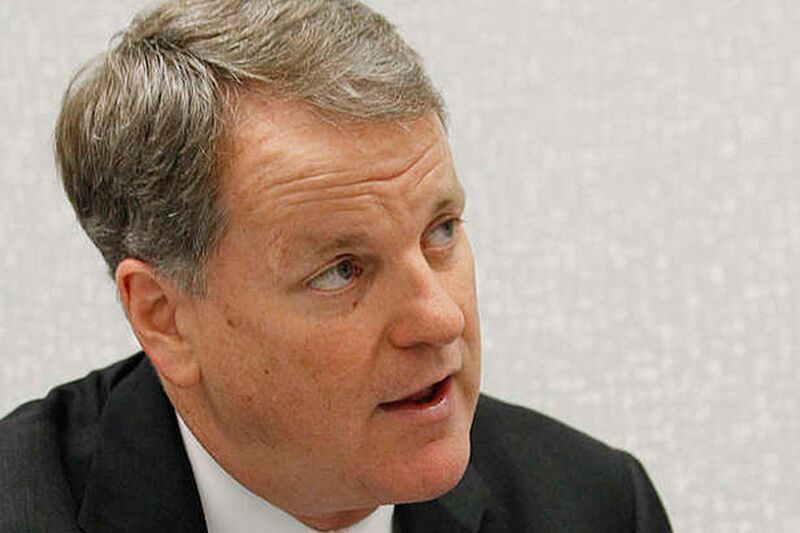 "Philadelphia is extremely important to US Airways and will be extremely important to the new American Airlines," he told The Inquirer's editorial board. Parker, who will head the new American when the deal closes, likely in September, was in Philadelphia for the first time since the planned merger was announced Feb. 14. Parker met with Mayor Nutter and went bowling with a group of 40 to 50 US Airways employees before heading to New York, where he will be a guest at 7 a.m. Wednesday on CNBC's Squawk Box. Parker has been on the road, meeting with elected officials and business leaders, including a Senate subcommittee last week, to spread the word that creating the world's largest airline will be good for employees, investors, and consumers, who will be able to fly to more places. "We are building a premier global airline. It really is good for everyone," Parker said, repeating, "We plan on maintaining all the existing hubs and service to all the destinations we serve." The two carriers' networks are complementary: Of 900 routes, only 12 overlap. The new American will have 6,700 daily flights to 336 destinations in 56 countries, and $40 billion in revenue. "We need all the airplanes. We need all the employees," Parker said. "That's not true for management, of course. We don't need all the management when we combine the two airlines. But our unionized employees, yes, we need them all." The combined airline will need the US Airways hub at Philadelphia International Airport and American's hub at New York's John F. Kennedy International Airport because, Parker said, they are "dramatically different operations. We fly them completely differently." In New York, with a much larger population, American does point-to-point flying and operates about 100 daily nonstops to Los Angeles, San Francisco, London, Europe, the Caribbean, and South America. Philadelphia is a connecting hub, where passengers are gathered from throughout the country and brought here. Some are local passengers who begin and end trips here, while others connect on flights to 113 nonstop destinations. JFK is a slot-controlled airport. The Port Authority of New York and New Jersey and the Federal Aviation Administration restrict the number of flights airlines can operate there. At JFK, there is not the room to expand to the 437 daily flights US Airways operates in Philadelphia. "There are capacity constraints at JFK," Parker said. "JFK will continue to be largely a point-to-point operation out of an enormous city and a very nice international gateway," he said. "And Philadelphia will continue to be a connecting international gateway that will provide nonstop service to all the places we fly today." Operating at Philadelphia International is about 60 percent less expensive than flying out of JFK, which potentially could bode well for increases in international flights here, from a cost perspective. "Nothing to announce in terms of new growth," Parker said, "but certainly the opportunities for growth internationally have now expanded because we are part of a bigger network." US Airways recently signed a two-year lease extension in Philadelphia, and in the next two years, airlines and the airport will evaluate the cost and need for a new fifth runway along the Delaware River. "If, indeed, there was a need for a new runway, we'd say, 'Yeah, we need this runway,' " Parker said. "It's just a question of do we really need it. "The last thing we, or the city, want is to build a runway that increases the cost of travel, because it's paid for with bond funding that goes through the airport, so it's paid for by passengers," Parker said. "We were just questioning some of the demand projections the city was using. We've agreed to work together on that. The merger should allow for more growth in Philadelphia, but we'll have to see if there is enough growth to justify another runway." Meanwhile, one of the airport's existing runways will be lengthened to 12,000 feet to accommodate large, long-haul aircraft capable of flying anywhere in the world. The U.S. Justice Department is reviewing the proposed merger. The issue Parker said he has heard from rival airlines was whether the combined US Airways-American should divest "slots" at Washington's Reagan National Airport. Slots are takeoff and landing times, assigned at airports. The new American would have two-thirds of the slots at Reagan airport, but 50 percent of the flights and airplane seats. If regulators require divestitures in Washington, smaller cities would lose flights because they are the least profitable destinations, Parker said. "This is a policy argument," he said, "not an antitrust violation or anything close to it." Once the merger becomes final, it could take an additional 18 months to integrate technology, reservation systems, flight schedules, and labor contracts. Until then, each airline would operate separate flights. The new carrier will have 100 million consumers enrolled in American's and US Airways' frequent-flier programs, where miles can be redeemed for travel. How the two frequent-flier-miles programs will be combined has not been decided. "Certainly, the goal is to make our customers happier, not less happy," Parker said. "We will integrate those in a way we think makes all our customers better off."